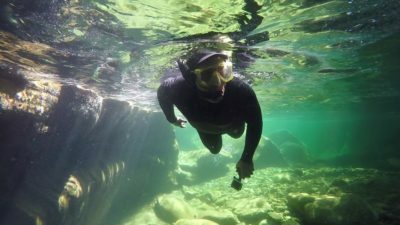 In praise of river snorkeling, a pastime for fish obsessives that also reminds riparian activists what they’re protecting. I’m like the reverse of a fish out of water — a floundering human in water, I think to myself and let out a nervous chuckle. This breaks the seal my mouth has formed around the snorkel’s mouthpiece, and as the frigid Cascadian water of Icicle Creek hits the back of my throat I start floundering more, coughing and thrashing around like a hooked fish. Jesus, get a grip, continues my inner dialog. Show them you can handle yourself. Them refers to Matt Collins and Russ Ricketts, my guides for my first foray into river snorkeling. And show them you can handle yourself is something I recall thinking often, back when I used to live in these wonderful central Washington mountains, where the three of us worked at a ski area. It felt important to prove myself: Up on the hill, after a storm had dumped unfathomable amounts of snow, I would struggle to keep the nose of my snowboard floating above the fray, always feeling like the slowest, weakest member of the crew. Usually, I was.